I Will Remember The Little Things! Today I am wearing a little string tied to my finger, because today I need to remind myself of important truths. Do the little things now, because it will just pile up if I don’t. And piling up is overwhelming. Remember to count the little things as being productive and successful when I think about my day. Have you ever seen a tiny piece of trash in the corner of your floor and walked past it several times? And every time you think to yourself – “I need to clean that piece of paper off the floor.” The first time it seems like no big deal, but the more you leave it there, the harder it becomes to just pick it up and throw it in the trash. What if you put that paper in the trash the first time you saw it? What if you never had to think about it again? There are lots of “little pieces of garbage” in our lives that we can throw in the trash immediately. 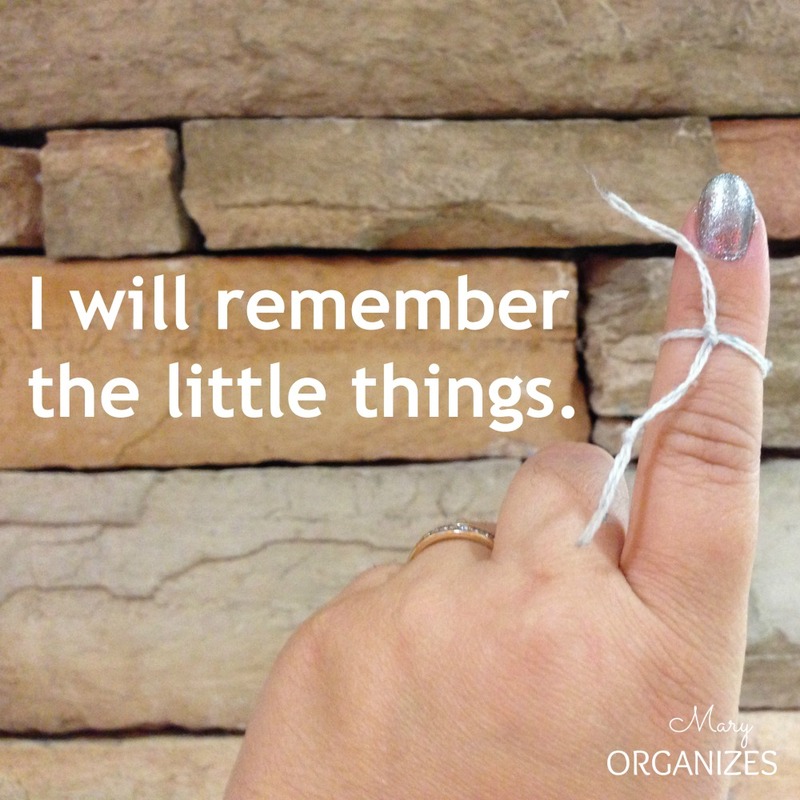 Today, I am reminding myself to do the little things right away. Put the mail away, put the dish right in the dishwasher, unload the dishes the first time I notice the dishwasher is empty, pick the dirty clothes up off the floor right away, hang the jacket up instead of laying it on the couch, tidy up the baby’s toys really quick before he naps. Basically: Get on things right away! The second thing I am remembering today is an addendum to the first, and probably even more important. I need to count the little things and give myself credit for all the things that pop into my day that were never on my to do list. Lots of little things can take up most of the day, and if you don’t count them, you look back and wonder what you did. A mother understands well what it feels like to FEEL busy all day, but not really be able to describe in words anything that was accomplished. Baby falls and cries, so I snuggle him for 20 minutes and read him a book. That counts. My big girl wants to practice her spelling words, so I stop what I’m doing and rehearse them with her for 20 minutes. That counts. A friend calls and needs to talk, so I stop what I’m doing to really listen. That counts. I changed 12 diapers on a wiggly baby. That counts. I got a bill in the mail and there was a mistake and I was put on hold for 10 minutes when I called to work it out. That counts. My sweet daughter drops her glass of water all over the wood floor, and it needs to be cleaned up immediately. That counts. I showered today. That counts. I had to pick up 50 toys to be able to even vacuum today, so a 20 minute chore took 40 minutes. That counts. I chased around a baby intent on emptying the bookshelves if I looked away. That counts. I get to realize that a “quick run” to the post office realistically takes an hour, no matter how long the line. And that it takes a good 30 minutes to do the pre-emptive after-school decompress, before home work and snacks and chores even start. I will realize these things and not fight the flow so much. Mostly: I will accept that my day will never look impressive on paper, but I KNOW that I’m doing more than could ever be adequately written. And I will remember that whether or not anyone ever knows about them, or if I can never explain the cost: it counts, the work I do counts. Truly, all of the little things between the big things really make up the majority of our life. Let’s embrace the little things and be content. 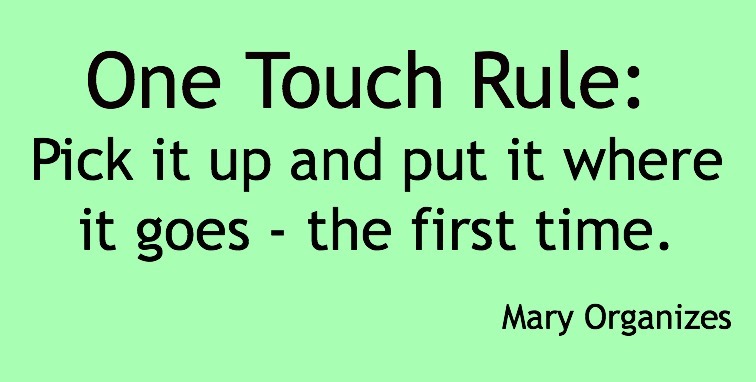 Really great post, Mary. Really thoughtfully written. I just stumbled across your blog today and I have LOVED reading through the posts. I work full time, have 1 infant, and 2 step-children (5 & 7). I love to be organized and have a clean house but have found this challenging over the last few weeks/months and want to get back on track. This post really hit home for me – there are times when i’m not sure where all of my time has gone and Im disappointed with myself for not getting more done in the course of a day but now when I look back I really am getting so much done and need to give myself more credit. Thank you for taking the time to put this all on ‘paper’ it helps to refocus our attention! I love this post! I thought I was the only one doing one million little things in between… thank you!!! Nope, just a day in the life!